My investment in my own heavy duty gazebo paid off, as the weather was quite windy for this event. The gazebo stood up well, without having to use the guy ropes, and was easy to put up and take down - it was just a bit of a squash fitting everything into the car! At this event I will have a wide selection of HANGA brooch/pendants, along with Art-Brooches, decorative photo frames and photo albums and a nice selection of gifts for Valentine's Day. As we have just started a new year, I have decided to give my blog/website a new look. I have started with the header and will work on revamping the rest of the layout over the next month or so. This will include adding a 'Gallery' of polymer clay work in addition to my Art-Brooches and HANGAs. I have also got a bit behind on adding posts, as I have been busy creating new stock for the big Auckland Aniversary Art & Craft Market at Mission Bay (see next post), so I must get up-to-date with everything. 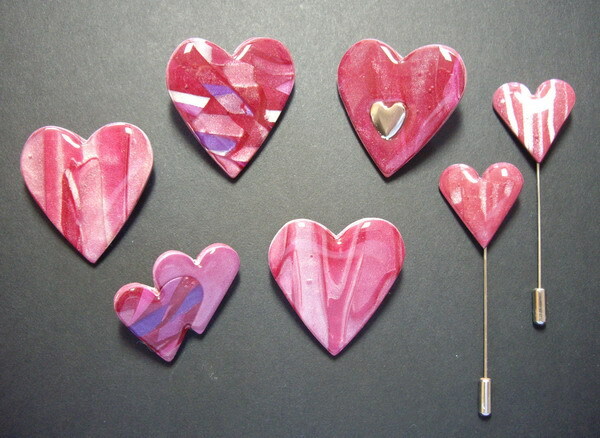 Here are a few things I have made recently on a heart theme, with Valentine's Day gifts in mind. Here are my two paintings on the opening night of this exhibition, which runs throught to the 12 Febraury. It is the first time I have exhibited as a member of the Mairangi Arts Centre. Here are the fronts of two mini photo albums that I have decorated with my hand-made mosaic tiles - click on each image to enlarge the photo. See the 'Gallery' for different shots showing the backs as well. I thought I would spend a the first couple of weeks of the New Year doing something different for a change, before I resume making more HANGAs. 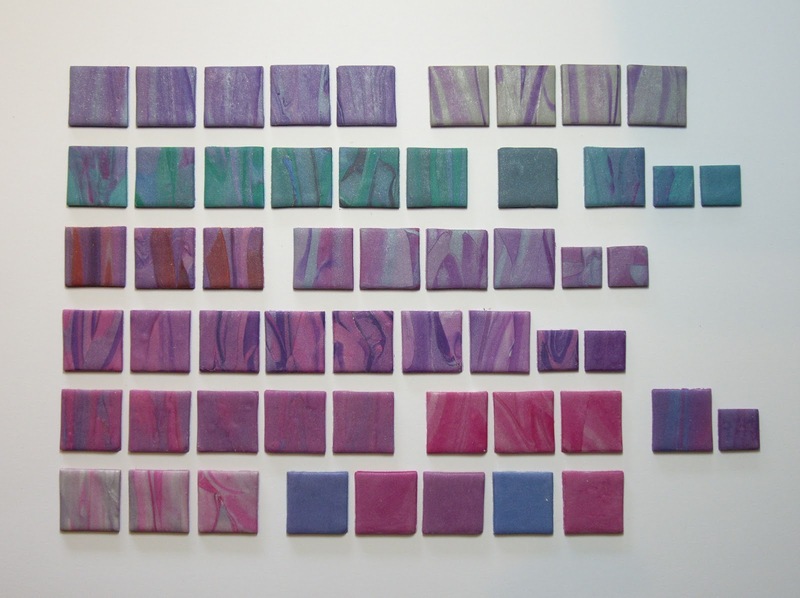 Here are some mosaic tiles that I have thoroughly enjoyed making. 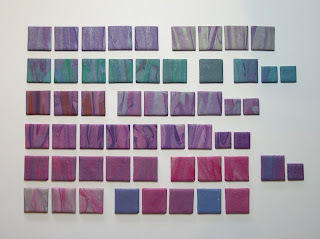 My original reason for turning to polymer clay was to make mosaic tiles but somehow this has got pushed aside as the Art-Brooches and HANGAs have developed. 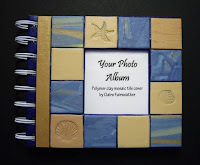 I am currently making more tiles and have several projects to use them on, such as photo frames and photo album covers, as well as just for artwork. I will post some photos as these get completed. To expand my range of HANGAs in both surface decoration and shape, and to find more sales outlets. Open an Etsy shop to sell my HANGAs, and other pieces of polymer clay art/craft work, to a wider audience. 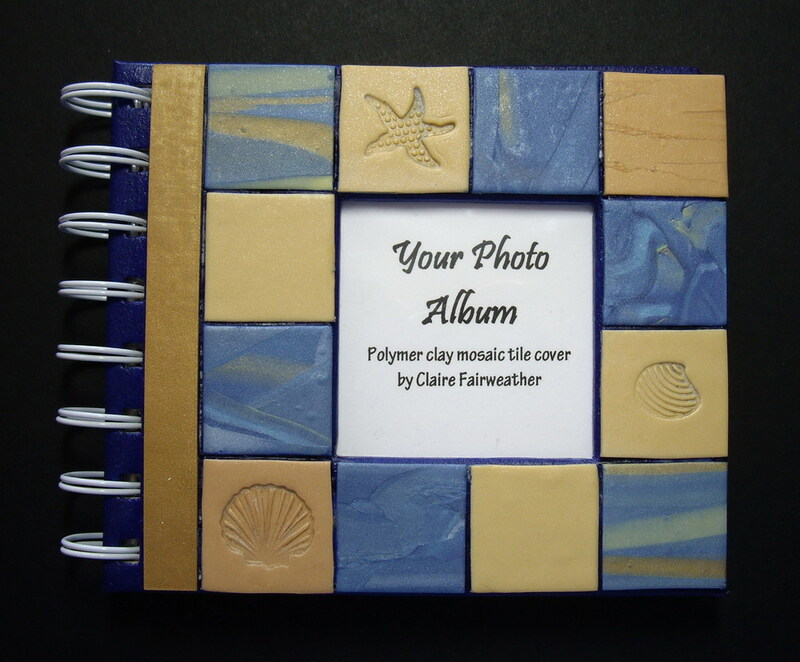 To create some polymer clay mosaic artwork. (This was my original reason for trying this medium, which has somehow got lost as the Art-Brooches and HANGAs developed, when I had less time for creative work). To get some polymer clay art/craft work in a few selected galleries, to establish some credibility here in New Zealand. Try teaching some polymer clay workshops, initially through the Mairangi Arts Centre, to introduce others to the joy of working with this fantastic medium. I will make sure that I review my progress on these goals at the end of the year, to determine how successful 2011 has been in terms of creative achievement.